While we all love our traditional Thanksgiving dishes, it's always a fun time to excite our taste buds with some new dishes. We have some yummy ideas of foods to add to your traditional Thanksgiving meal which will leave your guests wanting more. Why not go all out with the food themes of Thankgsiving? Have a side of Pumpkin Rolls before moving on to your Pumpkin Pie Dessert! 1. In the bowl of a stand mixer fitted with the dough hook, dissolve the sugar in the lukewarm milk. Sprinkle the yeast over the milk and stir gently. Let it sit for 3 minutes until light and foamy. 2. Add flour, 3 tbsp butter, salt, pumpkin puree, and shredded cheddar cheese. Knead at medium speed until the dough is smooth and elastic. 3. Turn out the dough onto a lightly floured surface and knead for a few more minutes. 4. Place dough in a greased bowl, cover, and let rise in a warm place for about 1 hour until doubled. 5. Lightly grease two 12-count muffin pans with butter. Set aside. 6. Punch down the dough. Break off small pieces and roll into balls (about 1-inch diameter). Place three dough balls into each muffin cup. 7. Cover the muffin pan loosely with plastic wrap and let rise in a warm, draft-free area until doubled, about 20-30 mins. Make-Ahead Note: The assembled muffin pan can be wrapped in plastic wrap and refrigerated overnight. Let the dough come to room temperature for 30 minutes before baking. 8. Meanwhile, preheat your oven to 375°F (190°C). 9. Brush the tops of the dinner rolls with butter and bake for 16-20 minutes until the tops are golden. Take the rolls out and brush with more butter, if desired. Leftover Pumpkin Dinner Rolls also freeze great. Take them out of the freezer a few hours before you want to serve them and reheat in the oven at 300°F, about 5-10 minutes. These tasty mushrooms are easy and quick to make! You’ll love them as a side to your turkey! Why not add coleslaw to your Thanksgiving meal? This cranberry slaw might even be more popular than the cranberry sauce this year! Make the dressing: Whisk the vinegar, oil, maple syrup, Dijon, and salt together in a large bowl. Add the red onion and stir to combine. Let sit at least 10 minutes for the flavors to meld. Meanwhile, prepare the cabbage. Make the salad: Cut the cabbage into eight wedges through the core, then cut the core from each piece. Thinly slice the cabbage wedges crosswise to shred. 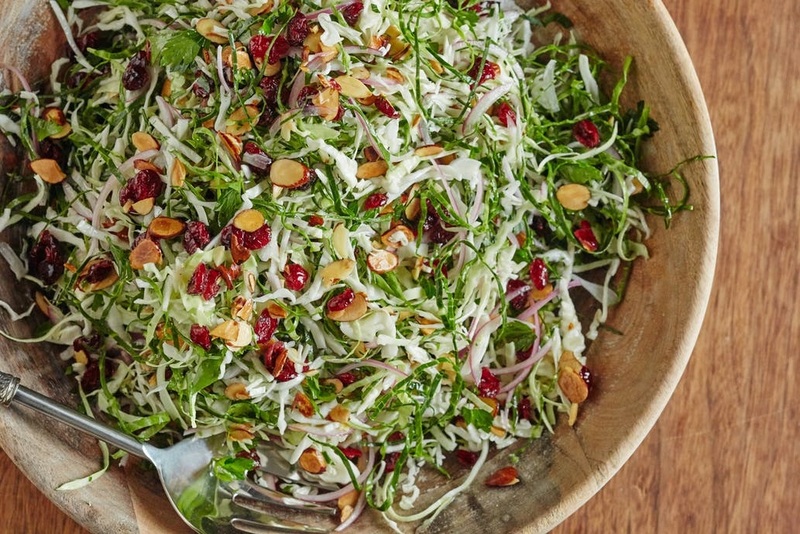 Add the shredded cabbage, almonds, cranberries, and parsley to the dressing and toss to combine. Taste and season with salt and pepper as needed. Make ahead: This slaw can sit out at room temperature for up to 2 hours without wilting, making it a great make-ahead or buffet dish. Storage: Leftover slaw can be stored in an airtight container in the refrigerator for up to 1 day. Are you looking to use your dessert as a decoration? Or just tired of a boring apple pie? This Rose Apple Pie will help you get into touch with your creative side. 1. Wash the apples and pat dry. Slice each apple in half lengthwise, and then remove the core and seeds. Slice the apple halves lengthwise to 1/8-inch thick pieces. Place the apple slices into a large bowl. Sprinkle both sugars and cinnamon over the apples. Gently stir to coat. Let apples stand for 10 minutes. 2. Transfer the apples to a large skillet set over low heat. Simmer the apples, gently stirring periodically, to soften to the point that the slices are easily bent, but not soft to the point of breaking down—between 8 to 10 minutes. Transfer the apples and all juices from the pan back to the large bowl to cool. 3. Preheat the oven to 425 degrees F.
4. Once the apples are cool, begin to arrange the slices, cut side down, into the pastry lined pie plate. Working from the outer edge of the interior, arrange individual apple slices, skin side up, along the perimeter of the pie, positioning each new slice to cover about one-third of the apple slice immediately proceeding it. 5. Once the first row is complete around the interior, continue on with the next row around, overlapping slices as in the first row, and nesting each slice snugly against the row preceding it. Work toward the center of the pie with each subsequent row. Apple slices should be arranged in as dense a pattern as possible. 6. After the rows of apple slices have filled all but the center inch or so of the pie, prepare the center of the rose bud by tightly rolling one slice into a spiral. Wind another slice around that spiral, and continue with additional apple slices until the “rose bud” is large enough to fill the small gap of fruit in the very center of the pie. Carefully nestle the “rose bud” cut side down into the center of the pie. 8. Bake at 425 degrees F for 20 minutes. Reduce the heat to 375 degrees and continue baking for 30 to 40 minutes or until apples are soft and crust is evenly browned. Remove the pie from the oven, setting it on a wire rack to cool. 9. Immediately brush all of the reserved syrup over the hot apple slices. Let the pie stand to completely cool before slicing to serve. Rose Apple Pie is a delicate pastry, as opposed to a heartier apple pie. The light syrup brushed over the finished pie adds a touch of sweetness, and keeps the apples from drying out. For best presentation, use a very sharp knife to cut the pie from the outer edge of the crust, working toward the center. Any slices that shift upon plating are easily moved back into place manually. Leftover pie may be covered in plastic wrap and refrigerated for up to two days. "HOME is Where Our Story Begins..."